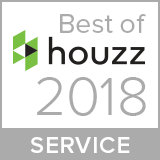 Detroit, Michigan, January 18, 2018 – Thoms Bros. Landscaping, Inc. of Macomb has won “Best Of Customer Service” on Houzz®, the leading platform for home remodeling and design. The 27-year old landscape design, build and management firm was chosen by the more than 40 million monthly unique users that comprise the Houzz community from among more than one million active home building, remodeling and design industry professionals. Thoms Bros. Landscaping, Inc. is an award winning landscape design, build, and management firm servicing the greater southeast Michigan area. Since 1991, Thoms Bros. Landscaping, Inc. has grown steadily from a small maintenance company into a completely integrated landscaping firm: design, build, and management. Thoms Bros. now services clients through all landscape processes; design, coordination of builder and architecture teams, construction implementation, management, and environmental care. By combining the professional abilities of the owners, Scot F. Thoms and Steven D. Thoms with their highly trained team members, Thoms Bros. can deliver maximum value while meeting individual client needs and expectations.